First, we create a pool of candidates. Each year Super Dentists invites dentists to nominate colleagues they know to be exceptional in their specified field. Dentists are asked to consider the following question: "If you needed care in one of the following specialties, which dentist would you choose?" Numerous safeguards are in place to prevent ballot manipulation and dentists may not self-nominate. Our research staff also contributes to the pool of candidates by searching medical databases, online sources, and publications for dentists who have attained certain credentials, honors or professional achievements - what we term 'Star Search Credentials.' This process also includes dentists in less visible or highly specialized medical treatment areas. Nominees are then grouped into specialties. Dentists, in each area, who have the highest scores from the nomination and evaluation steps are invited to serve on a "blue ribbon panel." Each panelist is asked to review and evaluate a list of nominees from his/her area of focus. The last step is to total the points received from nominations, research, and blue ribbon panel review. Only the highest-scoring doctors are included on the Super Dentists list. The Super Dentists list is limited to 10% of the dentists within the respective state or region. Each candidate is contacted to verify the dentist's professional information. Dentists are asked to verify they have not been subject to disciplinary or criminal proceedings. The research staff also independently reviews the discipline record of each candidate before publication and verifies that the dentist is active and in good standing. Even if selected, a candidate's name will not be published on the Super Dentists list unless all information is confirmed prior to publication. Licensed and active dentists are eligible to register. 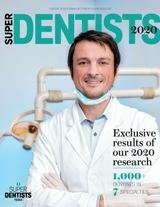 Super Dentists reserves the right to remove candidates and selectees if we determine that they do not meet eligibility, research, and review criteria.